Updated – 2019. Starting a carpet cleaning business what do i need? Im James, I own local Cardiff based carpet cleaning company Vale Carpet Cleaning. I feel this guide will help out a lot of people who want to either add carpet cleaning to supplement their current income, or infact start a carpet cleaning business like I did. In addition it will also hopefully stop you avoiding some of the pitfalls that I fell into. And believe it or not there are many. Although this is from a UK perspective, the principles and equipment still applies wherever you may be located. Which Carpet Cleaning Machine Should I Buy? Which Carpet Agitation Machines Are Best? What Carpet Cleaning Solutions Should I Use? What About Pet Urine Smells? I would recommend you go on a one or two-day course to pick up the basics of carpet cleaning. Be mindful that depending on what course you go on they will try and sell you their machines and their solutions (of course). You don’t need to do this, and it may be more cost effective buying your own machine and products as you go along (Although there are exceptions to this). I did the IICRC Carpet Cleaning Technician Course there are also very good courses offered by Prochem which start from £120 for a day course. Spray the carpeted areas with a “pre spray” – this is generally an alkaline solution which helps penetrate soiled areas, dirt and grime. Agitation – either manually or mechanically agitate the pre spray solution so it breaks down any stains and lift any dirt to the surface, this stage is the most vital in my opinion. Use the carpet cleaning machine to rinse (acidic solution to leave the carpet in a neutral ph state) and extract. Any difficult stains that remain, you can treat using specialist spot removers. Use a carpet groom to reset the carpet pile and this also assists with drying time. You can also read a little more of how we clean carpets here. A “walk behind machine” (which you use like a hoover). A machine with a wand (which you use like a vacuum). And a “truck mount machine” (these run off petrol or a generator directly from your van). You can either start off with a second hand machine which I did, or if you have the money, buy brand new straight away. Carpet cleaning machines drop considerably in value once used, so its definitely a buyers’ market. You can half the cost most of the time by buying second hand. Truck mounts are really expensive (£15,000 plus), and a big outlay if your just starting out. so I would go with a portable machine first. Brands such as Prochem, Craftex, Truvox are always generally great quality. Pros – Lightweight, portable, rotating brush head built in. Can connect the Prochem stair tool to it. Can use for hard floors aswell as carpets. Cons – Not really suited for commercial jobs, small tank 11.3 litres, no heater. Pros – Large tank 26 litres, looks good, external heater option, decent vacuums. Notable alternatives are The ‘Jaguar’ machine by World of Clean, and the ‘Enforcer’ by Ashbys I have been told are up there with the best also. 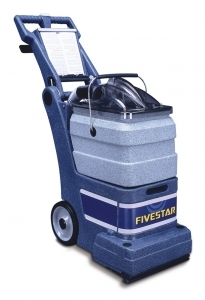 Pros – In my opinion, this is the best portable carpet cleaning machine for your money. 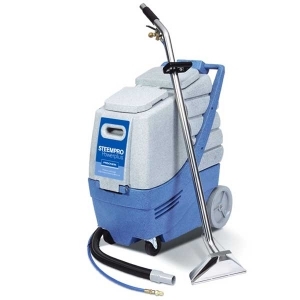 Looks the business (also available in black), powerful vacs, up to 800 psi. Heater option available. I would probably choose the Floor Mac, as its not that much more expensive than the Sebo, plus you have a choice of brush heads, which are handy when tackling commercial carpets, the sebo duo wouldn’t be strong enough. The CRB is very expensive in my opinion. Pros – Very well made (german manufactured). Great for domestic carpets. Cons – Brushes are quite expensive to replace. Not powerful enough for commercial use. Can;t really use on stairs. Pros – Lighweight, choice of detachable brush heads, can use for hard floor aswell as carpets. Can spray solution out. Can use on stairs. Cons – Spray nozzel is very weak. Pros – The ultimate agitation machine. Super powerful. Can also use on hard floors and be used for encapsulation cleaning. Cons – Very expensive, heavy when compared to other options. As previously mentioned, the general rule of thumb is pre-sprays are alkaline and you put a rinse in the machine to extract, which is acidic. However you also could go down the route of every solution being PH neutral. These are usually known as “natural, or organic” solutions. They do a decent job. But I would opt for the alkaline pre-sray and acidic rinse, as I think it does a better job. With so much choice in terms of cleaning chemicals, iv wittled it down to the best, which iv tried and tested, and belive me iv tried alot. The reality is you don’t need all these “specialist stain removers” as there is a stain remover for absolutly everything. Safe your money. Both these pre-sprays can be used as a “spotter” especially the M-Power, just lower the dillution, perhaps 1:4. I would only recommend the attention of one specialist stain remove which I will specify later. I think this is the best “all rounder”. I use it on both domestic and commercial carpets. It needs to be mixed with hot water. It’s powerful enough to blast away difficult stains and heavy traffic marks. But also gentle enough to use on wool. World of clean has a great reputation of producing their own carpet cleaning solutions. The M-Power is one of their best selling products. Not only is it eco-friendly. But it dilutes at an unbelievable 1:120. Which saves you alot of money over time. Have used this for years, never ever had a single issue with using it. It’s suitable for any fabric and carpet. Woolsafe approved. Also contains a odour neuraliser. Just a capful or two is all you need in the clean water tank. If for any reason you want an alternative to the Prochem Fibre and Fabric Rinse, then try Craftex. Products were created by a former co owner of Prochem, so it’s no wonder their products a very similar. Their solutions are slightly cheaper price too. I like this one as in my opinion the smell is a bit nicer then the Prochem, smells a bit like coca cola. Dilution Rate. 100. As discussed, the pre-spray can take care of most stains. However oil based stains need a solvent based stain remover. The best most economical one I have come across is Citra Clean Concentrate by Bio Productions. Contains orange essence. You can also use it on hard floors. It tackles chewing gum, tarmac stains, ink, mascara gloss paint etc. Sometimes clients carpets look pretty clean already. Thus even though you know and can tell by the dirty water how much cleaner they are, its a very good idea to leave a nice smell behind. Holy moly, this stuff is incredible! It is so strong. Literally you only need one or two drops in your tank or direct to carpet to fill the room with a lovely cherry bakewell smell. This deodoriser of all iv tried gets the most compliments from clients. Be careful not to get any on your skin or clothes its strong stuff. If your not keen on the cherry smell, then go with Craftex Clean Cotton. To leave a clean smell behind. Its bonus is it’s anti bacterial. It kills a wide range of germs caused by pets, urine, vomit, smoke, faeces, etc. Old Dog and Cat urine is a carpet cleaners worst nightmare (especially if on wool carpets). If its penetrated to the underlay, then you need to remove/replace the underlay. If your lucky or fresh then its just on the surface. The only product iv found that will eat away the smell is made by World of Clean. The ammonia and bacteria need to broken down Its called “Natural Odour Neutraliser”. You only need a couple of sprays direct to the effected area. Its contains essential oils and it smells like a soft spicy aftershave. But its very pleasant, and does actually work. It costs about £7 for 500ml. Carpet Rake/Carpet Pile Brush, use this after the carpets have been cleaned to leave a nice finish to the pile. Small hand held brush for agitating stains and upholstery. Bucket with a wide lip. Silver foils, you put these under any furniture which has metal feet, so it avoids any rust marks. Spoon or piece plastic filling knife. I use the back of a spoon to help remove chewing gum and any other hard materials on carpet. Again, this is a difficult one, and why I never give specific prices on my website. It depends on a number of factors such as; location, how dirty/stained the carpets are, if they have pets, are they students at end of tenancy etc. For domesic jobs as a rough guide, assuming the carpets are in average condition, £20-£30 is average cost per bedroom. Some lounges are big, so you can go a bit higher like £40-£50. Try not to go out for just one room, as the time you have set up and packed away the equipment, its very time consuming, if you can do a special offer such as 3 for 2 or something similar. For commercial carpet jobs again depends on size, but £1.50-£2.50 a square meter seems about the average going rate. You can find out a bit more about average carpet cleaning prices here. TIP: Never guarantee to a customer that you will remove a stain completely. Its better to under promise and over deliver. The variables are vast. Stains on wool carpets are usually tougher to remove than those on synthetic. If the stain has “set” (sat a long time) it can be tough to remove. There are a number of ways to get new business. Having a website is essential. Leaflet drops with special offers is a good way to get your business/brand out there. Facebook is another good method, connect with local residents and groups. Contact in person local letting agents, you will find many landlords expect the tenant to have their carpets professional cleaned before they leave. Teaming up with a local domestic or window cleaner is another good free way of marketing your company. Offer them a commission for referrals. I hope you find some useful things in this post. If you like it, please share it. And if you have any comments or questions please feel free to comment below or drop me a email. 4 reasons why Cardiff is the best city to live in How Much Do Professional Carpet Cleaning Services Cost?